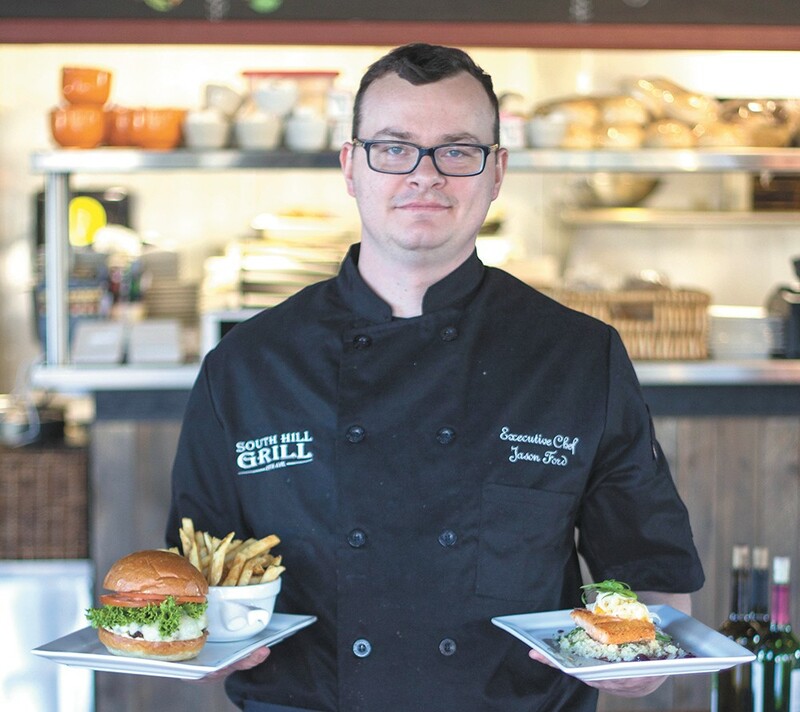 Executive Chef Jason Ford with his South Hill Grill Burger and ginger salmon dish. Owners expect some turbulence when opening a new eatery, especially one in the same spot as a defunct old favorite, so Cory Ehrgott knew there would be challenges in bringing his own vision to life in the former location of Maggie's South Hill Grill. What he couldn't predict, though, was the March fire next door at Studio K Bar & Grill just a couple of months after he bought the place and started renovating, adding a bar, installing a garage-style roll-up door and expanding the patio. "I got affected with a bunch of smoke and water damage, and then it became an insurance issue," Ehrgott says of the disaster that delayed his opening from April until after Labor Day. "We basically had to gut everything out and start all over. It was pretty deflating, and it was a real heartache to go through it." Now open a few weeks, Ehrgott is pleasantly surprised at how busy his new South Hill Grill has been, thanks to a combination of neighborhood dwellers, old Maggie's regulars and a younger crowd who might know him from Lucky's Irish Pub, the bar Ehrgott owns downtown. He kept some of Maggie's most popular items on his menu — the chicken pot pie, Maggie's signature salad, the Mediterranean Benedict at breakfast — as well as a large array of gluten-free items, as the old proprietors featured. But Ehrgott has added fresh steaks and a full liquor license to the mix of familiar fare, all of it made "from scratch, with fresh ingredients." "We're not trying to do anything crazy with the menu, just good foods done right — back to the basics," Ehrgott says. "The stuff you can get at your grandparents' house, your parents' house, that sort of thing." On a recent patio-friendly Friday night, the Black and Bleu Burger ($13) — one of four burgers on the menu, all hand-pressed — came cooked to order with a nice array of Gorgonzola, shallots and Maytag blue cheese dressing on top; the Kaiser bun held it all together well. The fries on the side were good, if not particularly memorable. And the roasted salmon entrée ($14), served with fennel and orange salad atop herbed couscous and dressed with a blackberry mustard sauce, proved the kind of dish I'd return to the South Hill Grill to have again.